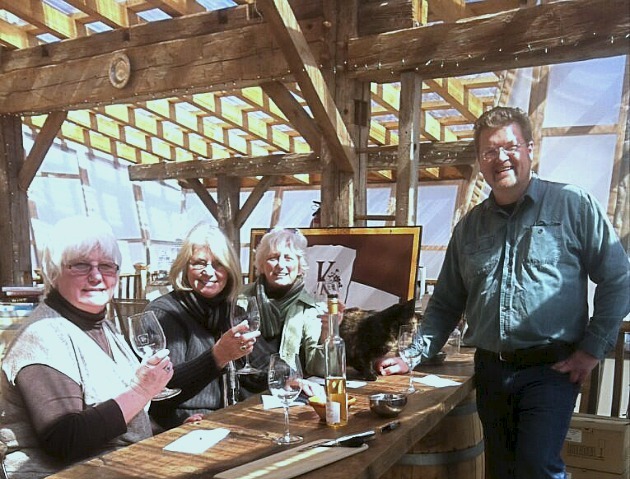 It was Sister’s Day, and we were touring Karlo Estates Winery in Prince Edward County. I mumbled something about terroir, but Sherry Martin, the incredibly articulate partner of owner / winemaker Richard Karlo gave us a mini seminar on where all those different flavours come from. She must have fielded this question many times before. “The best wine is made in the vineyard.” she began. She explained that each grape varietal has its own taste profile. Sauvignon Blanc is said to taste of gooseberries and cat pee; Riesling of green apples; Gewürztraminer of lichee and apricots; chardonnay, white fruits, butter or vanilla and creme brulé if its oaked etc. The flavours are more concentrated if you drop the crop load of the grapes on the vine, pruning back the secondary growth so the vine concentrates its efforts on the first growth. The weather has a great deal to with the taste. Grapes like it a bit of drought. The crops may fail but you’ll have great wines to drink while you starve. Drought forces the grapevine roots to dig ever deeper into the soil and limestone exposing the longer roots to greater minerality so prevalent in the County. How long the grapes stay on the vine before they are harvested makes a difference as well. Many winemakers harvest early, as soon as the grapes reach the required sugar level for ripeness. This produces a lighter. sweeter and more acidic wine with a more feminine profile. – excellent in sparkling wines. Richard prefers to harvest for phenolic ripeness when the seeds are brown producing a darker more full bodied wine with a more masculine profile. Karlo Estates often press their reds in December. Yeast is another factor in taste. Many wineries use a commercial yeast that fits the wine profile of the grapes. Richard prefers wild fermentation using the naturally occurring yeast in the vineyard that is present on the grape skin. Commercial yeast overpowers the flavour of the natural yeast but natural yeast can be risky. The colour and intensity of the wine is determined by how long the grapes are allowed to lie on their lees (grape skins, stem and seeds) after they are picked. Most people leave a Pinot Noir on its lees for a week before pressing. For Richard Karlo, his recent Pinot Noir had a week of cold soak, four weeks cold fermentation, and a one week maceration soak before it was pressed leaving the skins behind. How the wine is aged also affects the flavour, whether it’s stored in stainless steel tanks, new or old barrels and whether they are of French, Hungarian, American or even Canadian oak. One of Karlo’s more unique wines is their CHOA Chardonnay aged in barrels made from Canadian cherry, hickory, oak and ash staves by The Carriage House Cooperage. Oak enhances a wine’s flavour and adds more layers but it should never be allowed to overpower the taste of the grapes. Winemakers routinely check their wines once a month to see whether they should stay in the barrel, move to stainless tanks or be blended to get the right balance. Even once a wine is bottled, the flavour continues to develop as wine is a living entity and it gets mellower and more complex as it ages. If you need proof about wine being a living entity, visit the website of Dr Sondra Barrett who has photographed wine at the molecular level. What else adds to the flavour of wine? Comment below. I’ve heard it described before as oxidized goat pee. Interesting article. I’d be very curious to know how they get chocolate notes into the flavour of the wine. If you’d like to research the topic further and find out, I’d love to run the post on my chocolate blog. Cheers! Pingback: Press Release: Canadian wineries return to the UK for trade and press tasting | Magic's Wine Guide and Reviews for Newbies.